The Kaduna State Executive Council has approved the draft estimates of the 2017 Budget. At its meeting on Thursday, 6th October 2016, the Council further directed that the N189.9bn draft budget be submitted for public debate at a special town hall meeting, whose recommendations would be factored in before the amended draft budget is presented to the Kaduna State House of Assembly. The Budget Town Hall Meeting is scheduled for Saturday, 8 October 2016, following which the governor, Malam Nasir El-Rufai, will present the draft estimates to the state legislature on Wednesday, 12 October 2016. In a first for the state, the draft 2016 budget estimates were discussed at a town hall meeting prior to presentation to the state’s lawmakers. That public consultation led to the inclusion of additional capital projects worth more than N2bn into the budget, including the Birnin-Gwari dam. The Kaduna State Government has decided to institutionalise citizen participation in the budget process. At the Town Hall meeting, the basic thrust of the proposed N189.9bn draft 2017 budget will be explained to provide context and elicit inputs. The draft 2017 budget recognises that these tough times, with severe revenue challenges and economic contraction, require that government spending on key social sectors should expand. In addition, the determined efforts to attract private investments compel a sustained focus on improving infrastructure and the ease of doing business.. Tagged as the Budget of Jobs, Social Justice, and Prosperity, the draft 2017 budget gives priority allocation to capital projects. In line with the manifesto commitments made during the elections, Education, Health, Infrastructure (water, roads and transport), Agriculture and Rural Development are the sectors with the biggest capital allocations. 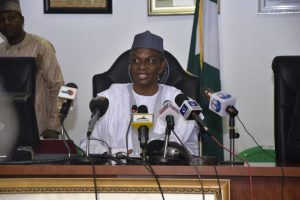 Muhammad Sani Abdullahi, the Commissioner of Budget and Planning, said that “the executive has a responsibility for early preparation and submission of the budget to give the legislature ample time to deliberate on it”. The draft 2016 budget was submitted to the lawmakers on 1st December 2015, and was signed into law on 22nd December 2015. The State Executive Council looks forward to the passage of the 2017 budget to enable the state government to begin implementing the 2017 appropriation for the people of Kaduna by 1st January 2017. The draft 2017 Budget is based on Zero-Based-Budgeting principles tailored towards actualising the objectives of the Kaduna State Development Plan (SDP) 2016-2020.